Trygg Air is an Alaska air taxi, charter and flightseeing provider offering backcountry ski trips, national park flights, wildlife flightseeing, fly-out fishing and more. What we really love about this client is that Trygg Air, owned and operated by Chris Klosterman, is willing to work with customers to create personalized, custom flights and itineraries so that they can have a truly unique and amazing backcountry experience. Keep in mind, Trygg Air does provide your run-of-the-mill air taxi service. Based in King Salmon, Alaska and Anchorage on Lake Hood, Trygg Air regularly flies customers to and from the two communities. Trygg also provides regular service to and from places like Brooks Falls, where people gather annually to witness the amazing spectacle of brown bear catching salmon at the falls. 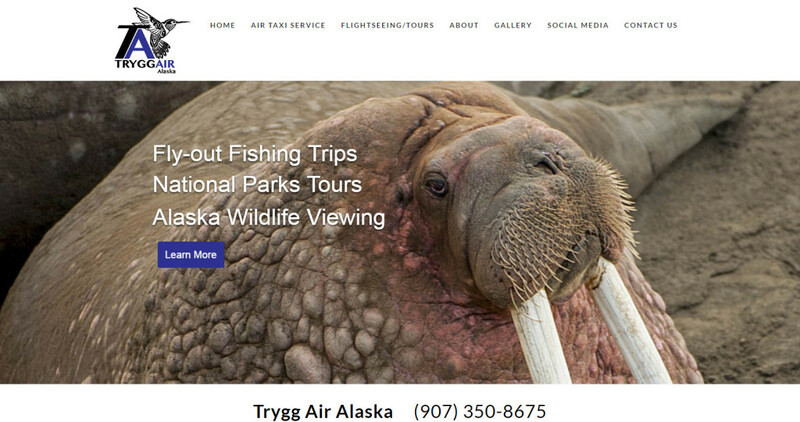 Trygg Air’s website project was an absolute joy to be involved with as it included fantastic photos of Alaska, wildlife, and the wild range of services provided by this particular Alaska air taxi. We were tasked with displaying the information and photos in a clean yet modern way, allowing visitors to the site and potential air taxi customers to be full impressed by the magnificent scenery and activities they might embark on. The site contains the full list of services, pricing, contact information and just about everything you’ll need to decide for yourself that Trygg Air should be the Alaska air taxi you hire next!.. if you want an extraordinary trip. Take a moment to visit the newly created website at http://tryggair.com.